Gitana del Mar Boutique Beach Resort is located on the shores of the Caribbean Sea in Colombia, South America. The resort lies at the foothills of the impressive and magical Sierra Nevada de Santa Marta, the world’s highest Coastal Mountain Range. This area is referred to as the Heart of the world, not only because of its geographical location, but more importantly because every single ecosystem exists and thrives in the Sierra Nevada mountains. 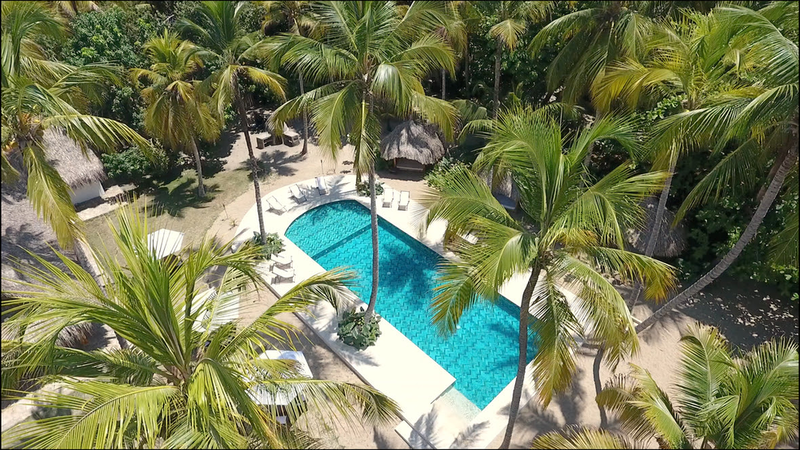 It is here in the shadow of the Sierra Nevada, nestled under the shade of majestic coconut palms, where you will discover a place where you can disconnect from the hectic world and appreciate the simpler things in life. Find harmony with mother earth as she offers up the sun, empty virgin beaches, fresh salt air and unforgettable panoramic seascapes. Gitana del Mar is a relaxing world where time moves slowly and you can reflect and appreciate all that life and nature have to give. Escape for a while to a life by the sea. Feel the raw energy of the Sierra Nevada mountains. Discover peace on empty white sand beaches. Rise with the sun over the Caribbean and fall asleep counting falling stars in the Milky Way. The kitchen works with the local fishermen of the area to bring whatever is fresh straight to your plate. This sea to table approach combines healthy ingredients together in a coastal themed, fusion-style menu with Colombian, Latin and Asian flavors. The ever-evolving selection is a unique combination of the traditional dishes and flavors from Colombia along with other recipes from around the world. The menu changes daily and three gourmet meals are included daily in the per person rate. This includes fresh fruit juices, bottled water, coffee and tea. The kitchen can accommodate any vegetarian, vegan or gluten-free requests as long as you let us know in advance. Join Emily and myself for five nights in this very special location. We are beyond excited to offer this true retreat setting. Enjoy everything this magical place has to offer as well as two yoga classes per day (some served up workshop style) in our signature creative alignment- based vinyasa style. Deepen your practice, restore and renew! Round trip group airport transfers via van from Santa Marta Airport (about a 1 hour and 20 minute ride) and Barranquilla International Airport (about a 2 and a 1/2 hour ride) at a set time. Payment via cash, check or Venmo. $250 non-refundable deposit to sign up. Payment plans are available. If you cancel your trip more than 90 days prior to the retreat start date, you are eligible for a refund (if we are able to fill your spot with another retreat participant). After this point, all trips are non-refundable. Email info@raquelmarrayoga.com with questions and to book.